The Wiggly Wormz is colourful, made from Super Soft Chenille fabric. Ave size 22cm long x 2cm wide head to 0.5cm tail. With the Interactive Wands, you can put life into wiggly Worm, so that he can can wiggle, creep, fly or dart around the room, or garden. Your cats' speed and grace will amaze you as they dash around trying to capture the prey! Simply clip on to play! The connection to the wand is via a strong cord hook on the front fixed to the plastic tubing. Various Colours - Yellow, Pink, Green, Purple and Blue. Colour preference unavailable, you may add a colour preference in the order comments box on checkout however if a certain colour is out of stock, another colour will be substituted. Please note - The Chenille fabric used is very soft and so it is to be expected that tuffs will become detached or ripped from the wormz cord core. 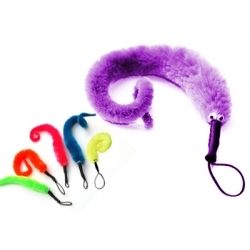 How long the wormy will last is dependant on your furkids play ie, rough or gentle, but you can bet he or she will have great fun with it. We recommend to put the Wormz away after play on the wands to preserve the toy as much as possible. The worm has two tiny googly eyes (size 3mm) which are non toxic children craft items. They can be picked off if you prefer not to have them on the toy before before playing with your cat.